Got the winter Marin Belvedere all spiffed up this past weekend. It's an upright, flat bar ride that makes me catch the wind like a sail. Compared to the road Giant, it's a tugboat. I huffed and puffed the 11 miles to the office from the park and ride lot at the mall. My plan is to start leaving a little earlier and stop at one of the coffee shops in before work. Haven't done it yet, but it's in the plans. I also think I have the Marin bug out of my system till next winter. I love my Marin San Marino. It's quite racy and very nice. 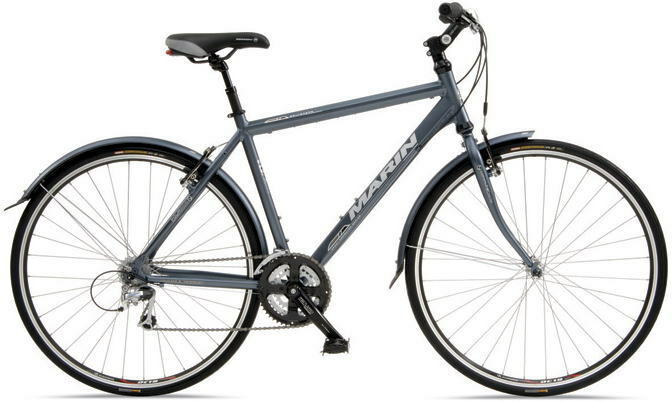 I assume the Marin is the "before this bike I really like now" bike. An old friend that you rode quite a bit. I just resurrected my old Nukeproof into what I am calling my commuter beast. All rigid and fat tires, but I can use it to commute off road if I want and on the road without too much of a loss in time. An old friend that deserves some riding time is really the reason I guess. Man, it may not be as efficient as a road bike but calling it a clunker seems a little extreme. I've found myself riding my old mountain bike, which I've converted to be a commuter, MORE lately, not less. It's not as efficient or fast as the road bike, but so long as you're not in a hurry, it can be pretty good. And it feels more solid on rough roads or on gravel. I also don't worry so much about getting caught in the rain, or theft.